As they say, where’s there’s good wine, there is good food, and Margaret River being a premium winery region is a point fact. Spend time in Margaret River in Western Australia’s south west and you’ll too soon discover that you’re spoilt for choice of great places to eat. Did you know that Margaret River produces just three per cent of wine in Australia but 25 per cent of Australia’s premium export wine? In short it means the wine here is really good. With any trip to Margaret River, be sure to pick up the latest map of the region found at various tourist attractions and of course the Margaret River Visitors Centre. It’s essential as there’s plenty of mobile blackspots ‘down south’ so Google maps can’t always be relied upon. Here’s a list of my favourite winery lunches in Margaret River. Enjoy! From the outside, the separate Cellar Door and Restaurant buildings are fairly non-descript, but that soon changes as soon as the ‘Get Smart’ sliding doors open up to reveal a dimly lit barrel room and that unmistakable heady aroma of oak, then another set of heavy sliding doors open to reveal the tasting area, flooded with light from floor-to-ceiling windows and commanding views of undulating hills covered in vines. Wow. It’s worth a stop at Amelia Park for the architecture alone. After a wine tasting – their Chardonnay was my pick – venture to the next building, to the restaurant for lunch run by husband and wife team Blair and Renee Allen. They make everything from scratch and use local produce including that from their kitchen garden. It’s fantastic and worthy of a visit. Tucked away down a dirt road, Arimia Estate’s cellar door is beautiful and it has a lovely outdoor area, space for kids to run around, really good wine and pretty good food. The shady outdoor area sees people sitting under trees on rugs, whiling away the afternoon. Arimia Estate is underrated in my book – it flies under the radar, perhaps because it’s not so obvious and not on a main road? Definitely go for a wine tasting. 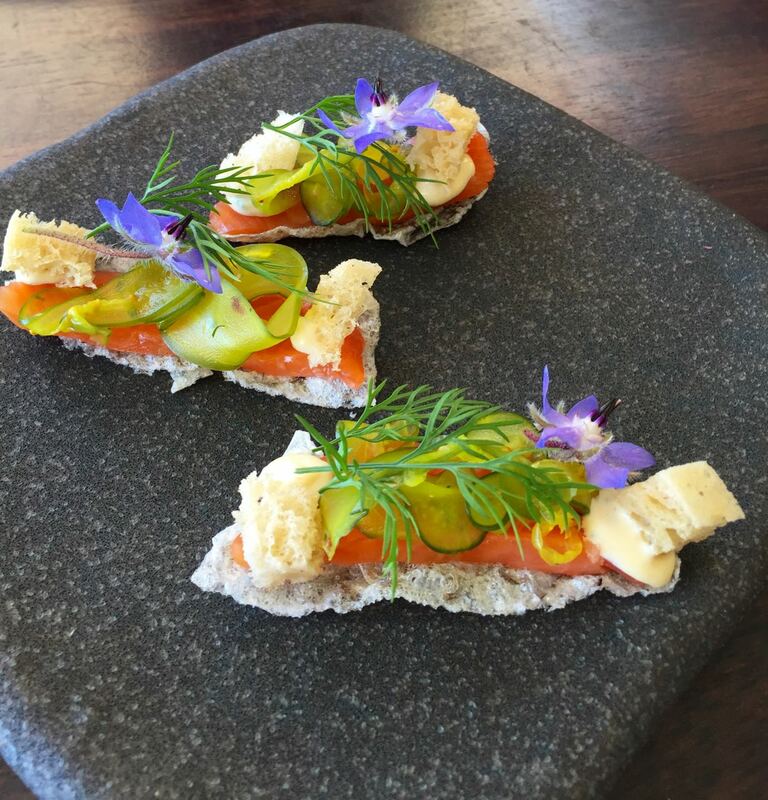 It’s been a couple of years since I last ate at Aravina, but I keep hearing good things about it – lots of compliments for head chef Ben Day, who worked under esteemed chef Aaron Carr at Vasse Felix for three years. Families love it and not just for the fantastic playground for kids, but for the beautiful cellar door and Hamptons-style homeware shop, and a very cool if somewhat out of place car museum with Ferraris and muscle cars (my favourite, the Torana SLR 5000 – brings back so many high school memories). It also has a kitchen garden with its bounty often featuring on the menu. A favourite for weddings which is easy to understand given the opulent fit out of the function room, pretty garden and immaculately manicured lawn. Biodynamic and organic principals guide not only the wine making but the kitchen too. A rustic cellar door leads through to the restaurant with a deck overlooking the vines. The food is delicious, simple, mostly organic and sourced from the kitchen garden on site. Highly regarded prized wines and good service make any lunch at Cullen a fab experience. A wander through the spiral kitchen garden is a must. Fishbone Wines specialises in sushi and Japanese food. The seafood, all sourced from 34 Degrees Blue, is designed to be light, fresh, and complement their wines. The modern cellar door and indoor seating area includes a huge fish tank. Outside on the terrace, there are views of green pastures. Located conveniently opposite the Margaret River Chocolate Factory – pop across the road for sweet treats and ice cream after. For a more formal lunch – we’re talking crisp table linen, smartly dressed wait staff, and cutlery choices to send ‘Pretty Woman’ into a spin, this place is where local chefs go to eat on a special occasion. The food is sensational. Try the 3-course ‘trust the chef’ menu. Great wines too and almost impossible to leave without a purchase. One of the best regarded wineries not only in Margaret River, but in Australia with a reputation that reaches far beyond our shores. The drive into Leeuwin Estate is as impressive as their award-winning wines, a meandering road flanked by tall timber Eucalypts with glimpses of vines in between. The restaurant’s bi-fold doors seamlessly carry the outside in as does the glass-covered roof added during the restaurant’s recent refurbishment. Step out onto the sweeping veranda with its impressive views over the manicured gardens, expansive lawn and the permanent stage that hosts some of the region’s most prestigious events. The setting, service, amazing wines, and fabulous food are a reason why so many love Leeuwin Estate. There is an impressive art gallery downstairs and owner Dennis Horgan has an order of Australia for his services to tourism in Western Australia. Definitely worth a visit, and once you’re settled on the upper deck, you may never want to leave. Ok, technically an olive grove not a winery but worthy of a mention because it’s a great place for lunch. At Olio Bello, they make fantastic fresh pasta, as good as I’ve had anywhere and I love the country style alfresco setting. The wine list is sensible with some cracking wines is reasonable prices. If available when you visit, have a piece of the lemon olive oil cake – it is divine – and don’t leave without some of Australia’s finest olive oils that are made with quality in mind, not quantity. If you like tapas, then you’ll love Rustico. If you love great food, then you’ll love Rustico. If you love a casual but cool vibe, then you’ll love Rustico. I can’t really fault this place. The food, the service, the menu choice and the wine are all on point. It’s a pretty setting too. Be sure to book, it’s a popular place and for good reason. And do yourself a favour and try the K&B Riesling in the cellar door – one of my favs. Awesome authentic, wood-fired crisp Italian pizza is as good as it gets at Swings in Roundabouts. I can never go past the margarita, it’s pizza perfection. The baked camembert is rich and gooey and worth every calorie. A casual winery lunch at its best. Grab a picnic table or a provided rug and stretch out on the lawn. Family and dog friendly too. The oldest winery in Margaret River, Vasse Felix’s restaurant is gorgeous and the food exceptional. The restaurant places great importance on sourcing the best local produce. Everything is made from scratch, including kangaroo pastrami. The Australian food critic John Lethlean wrote that Vasse Felix ‘set the benchmark for winery restaurants’ in his stellar review. Beautiful wines too with the Heytsbury and Tom Cullity recently rated 98 and 97 points by James Halliday, so don’t skip a tasting at the cellar door. Downstairs you’ll find an art gallery and cellar room. The view of the stunning grounds from the upstairs restaurant make this a lunch you won’t forget. This year saw a new head chef at Voyager, Santiago (Santi) Fernandez who has continued with Voyager’s signature seven-course Discovery Menu with each course inspired by one of their wines. The setting reminds me of a French luxury Chateau with the rich drapes, chesterfield sofas, and ornate light fittings – sitting inside you could forget you were at a winery. It’s would be awesome in winter. It does have the prettiest rose garden in the region and the biggest Australian flag in the country, after the one at Parliament House in Canberra. The white stucco Dutch inspired building stands proud in the beautifully manicured garden. Their wines are sublime and the restaurant service absolutely first class. A good choice for a fine dining experience or if out to impress. Now get ready to have your foodie socks blown off. Will Domain has a friendly yet premium atmosphere which isn’t at all stuffy. You’d be forgiven for daydreaming while taking in the stunning scenery – views of rolling hills and straight vines lead to a Manor House perched atop a distant hill. But as soon as the food hits the table, daydreams stop and delicious reality kicks in. Sophisticated and beautifully presented dishes that have been perfectly executed dishes will wow you. Chef Seth James (ex Cutler & Co, Melbourne) uses native ingredients in his dishes that surprise and delight the taste buds. The price point is at the upper end of the spectrum but totally worth the indulgence. Don’t miss an experience eating at Wills Domain, this place would be in my top three. Yarri – this is a new venture due to open at the end of January 2018 in Dunsborough by acclaimed chef Aaron Carr who has teamed up with Snake & Herring wines. According to the website, Yarri’s cuisine will honour nature, seasonality and the South-West – its people, produce and place. While not technically a winery, this restaurant is tipped to be the hottest place to eat at in 2018. If you get there, let me know what you think. These are wineries that I’ve not eaten at so can’t recommend. Let me know if you get to any of them and what you think. What are your favourite wineries in Margaret River to eat? Is there anywhere you think I should try?